-Available 24/7- | "No Recovery No Fee"
The field of products liability deals with defective products that cause injury or death. The defect in a product may be due to its design or manufacture. A product may also be defective because of lack of proper warnings. The types of product defect cases that our firm handles are varied and broad. It could be a simple household item like a toaster or a big industrial machine. It could also be the car you drive. In order to determine if there is a product defect, either a design or manufacturing defect, the product needs to be examined and analyzed. The product will be examined by experts retained by our firm who will provide us with their opinion as to whether there was a defect in the product that caused the injury. We offer a free initial consultation to all clients. For an appointment, contact our office online or call 305-643-3100 Ext. 206. We handle all personal injury claims, including products liability on a contingent fee basis. You pay no attorney fees unless we recover compensation for your losses. We will travel to meet with you, if necessary. We handle all personal injury claims on a contingent fee basis. We only charge attorney fees if we are able to recover compensation for your injuries, otherwise attorney fees will not be charged. If you cannot travel, we can arrange a meeting at a location convenient for you. 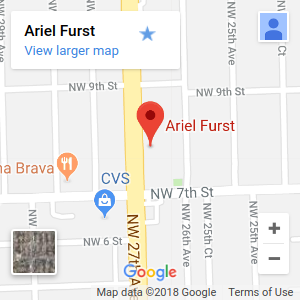 © 2017 Law Offices of Ariel E. Furst. All Rights Reserved.